DEDICATED to St. Oswald, which is of Saxon origin, contains at the west end some remains of the original fabric. There is a very ancient doorway, formed by a large stone, resting on two other large stones, having on one side, some grotesque figures, carved in a very rude manner; and on the other side, next the present belfry, a wreathed pattern is carved; and above this stone circular. arch, filled up with small square stones, very neatly put together in, the diamond pattern. This I conceive to be a remnant of the pure Saxon architecture and to have been the principal entrance to the Church before the steeple was erected. The illuminated letter A, at the beginning of this chapter conveys a correct representation of this curious piece f antiquity on the west side; and the woodcut below gives a facsimile of the figures on the east side. The Saxon part of the building may still be discretely traced by the masonry. The stones are all square and of the same size and are a different sort of stone from the other parts. This is very plain at the west end above the ancient doorway before alluded to. 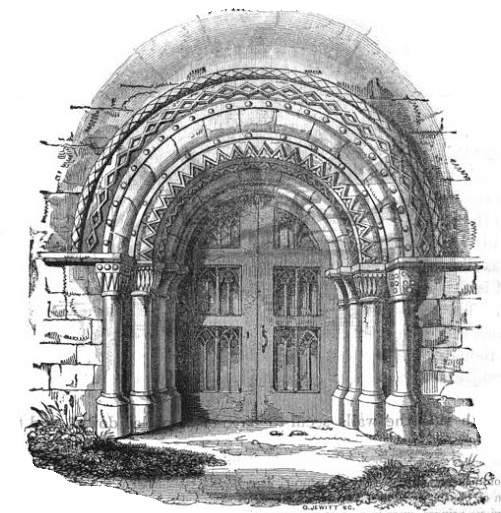 Saxon materials used as far as they go; the remaining part having been finished with Roche Abbey stones, well wrought, but of various dimensions*; The south door and the porch are as early as the time of Henry the Fiirst. It consists of one of those highly ornamental semicircular arches, which are scarcely, ever to be found at all in buildings of a later age. It is a very fine specimen of Norman Saxon architecture and the capitals of the pillars, are exactly of the same pattern as those in the clerestory of the nave of the Church of St. Trinite, at Caen, which was founded about the time of the Conquest. 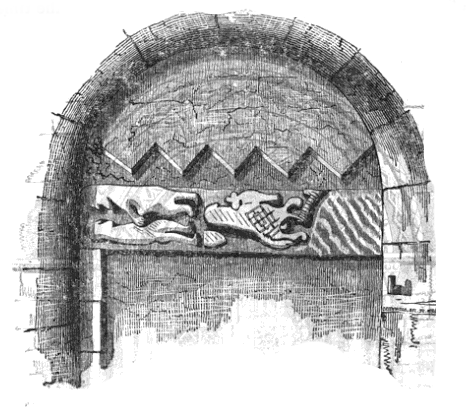 and inserted in the wall alternately with plain stones, as represented in the woodcut below. On the same side, above this stringcourse, is an elegant clerestory of three windows. The north aisle has been rebuilt, and the arches destroyed, for the purpose of erecting a gallery, in the year 1792, on the old pillars, which are circular, and sufficiently indicate the age to which they belong. Between the body of the Church and the chancel, there still remains a small portion of a very handsome screen, the same pattern as that in Althorpe Church. The ancient stone staircase to the rood-loft is through a buttress on the north side and now leads to a singing gallery*. The tower is built of good ashlar stone and has a beautiful window, which shows the transition from the Saxon to the Norman style of architecture, though the ornamental part of the work is somewhat decayed. I should conjecture, from the present appearance of the Church, that the original Saxon building consisted of a nave, north aisle, and chancel; that the tower and south doorway were afterwards built by the Abbots of Selby when they rebuilt the south wall. And in the Valor Ecclesiasticus of Henry the Eighth, the entry concerning the vicarage is as follows. Dns. Thomas Holgyll, vicar, idm. ulta, x. ps. p. x. c. et sinod, xiii. x. The sepulchral memorials in this Church are as follows. Mary Johnson, wife of Thos. Johnson, jun. died in 1831. Also T. B. Johnson, son of John Johnson, died in 1813. IN MEMORY OF THOMAS JOHNSON, WHO DIED IN 1790. WILLIAM JOHNSON, DIED IN 1813. SARAH JOHNSON, DIED IN 1826. ALSO, JOHN JOHNSON, DIED IN 1808. THOS. JOHNSON, DIED IN 1814. SONS OF THE ABOVE THOMAS JOHNSON. In memory of William Johnson, who departed this life the 8th day of June, 1813, aged 79 years. Also Sarah Johnson, wife of the above, who departed this life the 30lh day of July, 1826, aged 84 years. In memory of Thomas Johnson, who departed this life the sixth day of March, 1796, aged 66 years. Also Thomas, son to the late Thomas Johnson above named, who departed this life the 27th day of September, 1809, aged 13 years. ON THE EIGHTH DAY OF JULY, 183? IN THE 32nd YEAR OF HIS AGE. Here lieth the body of Ann, daughter of William and Sarah Johnson, who departed this life the 9th day of July, 1785, aged 9 years. Here lies the body of William Johnson, who departed this life April the 22nd, Anno Dom. 1725, aged 66 years. Here lies the body of John, the son of William Johnson, who departed this life February the 29th, Anno. Dom. 1731, aged 43 years. Here lies the body of Catherine Johnson, who departed this life July 23rd, 1723, aged 58. Here lies the body of Thomas Johnson, sen. who departed this life, December the 16th, 1771, in the 75th year of his age. Here also lieth Betty, the daughter of William and Sarah Johnson, who died February the 21st, 1772, aged 2 years. Here lies the body of Jane Johnson, who departed this life the 18th of September, 1795, aged 58 years. And after his many years labours for the lasting happiness of the whole parish, he being dead, yet speaketh to such parishioners as are still under strong delusion and wickedness, In the words of Stephen, Acts 7, 51, and and ot the Prophet Isaiah, 49. 4. IN THE 16th YEAR OF HIS AGE. IN THE 35th YEAR OF HER AGE. Here lies the body of Elizabeth Johnson, wife of Thomas Johnson, of Croule, who departed this life, the 9th of April, 1789, aged 78 years. Here lies the body of Abraham, the son of John and Elizabeth Venney, who departed this life July the 26th, 1779, aged 18 years. Here lies the body of Abraham, the son of John and Elizabeth Venney, who departed this life July the 26th, 1779, aged 18 years. Here lies tlie body of Elizabeth Venney, who departed this life Decem ber the 24th, 1771, in the 38th year of her age. Also, Betty Venney, daughter of the above, who departed this life the 17th day of February, 1825, in the 62nd year of her age. Also, Ann Johnson, who departed this life the 21st day of February, 1825 aged 82 years. Here lieth the body of John Venney, of the Levels, who departed this life the 19th of September, 1787, aged 61 years. Here lieth interred the precious remains of George, Son and Heir apar-ent of Geo. Stovin, Esq. and Sarah his wife, daughter of James Empson, late of Goole, in the County of York, Gentleman. He was ever dutiful to his parents, tender over his brother and sisters, and affable to all: well beloved, and a pattern of virtue to all young men. He was, in February last entered a member of the Honourable Society of Lincoln’s Inn; but was gathered in the bloom of youth, into the bosom of his heavenly Father. Mortuum An. Dom: 1734, March 12th. HIRST PRIORY, IN THIS COUNTY, ESQ. HIRST PRIORY IN THIS COUNTY, ESQ. IN WHOSE MEMORY THIS MONUMENT IS ERECTED. Also, lies interred, Harriet, daughter of Cornelius and Susannah Stovin, who departed this life the third of June, 1778, aged 10 months. Here lies interred, Elizabeth Stovin, daughter of Cornelius and Susannah Stovin, who departed this life the S$6lh of March, 1784, aged 13 years and 7 months. THE FOURTH OF JANUARY, 1820. AGED 37 YEARS AND 8 MONTHS. REV. CHAP. 14, V. 13. After the dissolution of the religious houses, the rectorial tithes were disposed of to laymen, and are now the property of R. P. Johnson, Esq. Temple, as the heir of Robert Popplewell. The Vicarage passed into the family of Ashbourne, who built the house in 1710, then into that of Egremont, who sold it lately to Mr. Duncombe, of Lincoln’s Inn Fields. The following is a list of the Vicars, as far as can be ascertained from the records at Lincoln. Presented by the Abbot of Selby. Instituted on their own Petition. This parish has the benefit of three Charities, one for the use of the poor, and two for the purposes of education. Thomas Walkwood surrendered five acres and twenty perches of land, lying in Ealand and Croule field, with a messuage wherein he then dwelt, with the orchards, stables, and buildings thereto belonging, situated in the north end of Croule, with the appurtenances, to the Minister and Churchwardens of Croule for the time being, and their successors, for the use of the poor for ever. Likewise, the same Thomas Walkwood surrendered two acres one rood twenty perches of land, lying in Croule Field ; the yearly rent of the said land to be disposed of by the Minister and Churchwardens of Croule, for the time being, and by their successors, for the teaching and well educating of certain poor children of the said parish for ever, according to the discretion of the said Minister and Churchwardens. In the reign of Richard the Second, the ancient Market and Fairs were removed from Garthorpe to this place, on the petition of the Abbot of Selby. One of the Keepers of the Game of the Hatfield Chase had a station at Croule. Croule presents the appearance of a very long straggling village rather than a town, though it contains a few houses of the better class. The streets and open Market Place are unpaved, and the shops are such as may be found in every other country village. There is a Society of Baptists, similar to that at West Butterwick. They have a small Chapel and burial ground, which contains a few sepulchral memorials of the family of Hind. * Wainwright. Croule presents the appearance of a very long straggling village rather than a town, though it contains a few houses of the better class. The streets and open Market Place are unpaved, and the shops are such as may be found in every other country village. There is a Society of Baptists, similar to that at West Butterwick. They have a small Chapel and burial ground, which contains a few sepulchral memorials of the family of Hind.